The term high-current tests summarizes types of tests which may need several kilo amps to be performed. Arc fault withstand capacity etc. Tests are performed with a test voltage according to the appropriate standard, for example 115% of the rated voltage of the test object. A requirement given by the standards is that the devices and power distribution systems have to fulfill their specified functions safely at these extreme short-circuit currents. The expanding energy density of the energy grid makes it necessary to provide extreme test currents far beyond 100,000 Amps for tests. I2PS has one of the world's most powerful testing systems. 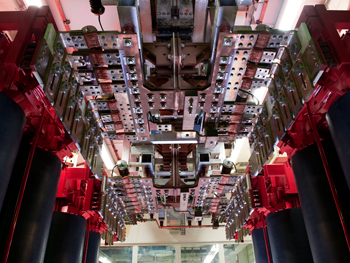 Tests with extreme short-circuit currents are used to examine the behavior that switchgear and assemblies are being exposed to at the limits of their technical and physical capacity. The results achieved with these tests are extremely important and serve to reassure project developers, installers, and owners that a switchgear device or a power distribution system will be able to meet all applicable requirements resulting from extreme failure or fault scenarios. An extensive control system makes it possible to precisely control all test procedures and to monitor system components. This ensures that a few seconds after completion of the test, he testing system is able to provide all the information required for a competent and comprehensive evaluation of the test results. 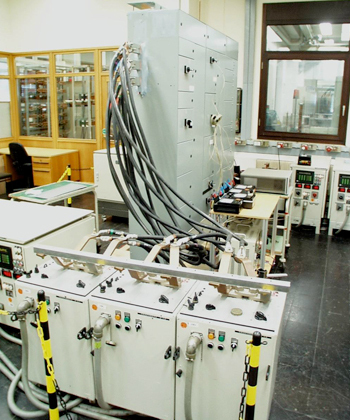 Other special measuring techniques from the Test Laboratory Bonn, such as high-speed video, laser vibrometers, and x-ray analyses, can be used as well. Low-voltage switchgear, low-voltage switchgear systems, low-voltage fuses, miniature circuit-breakers, variable frequency drives, soft starters, etc. All devices that have a corresponding protective function, such as circuit-breakers, overload relays, fuses, etc. 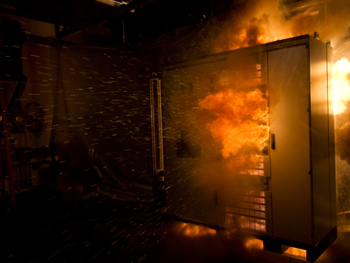 Temperature rise tests on electrical equipment and switchgear assemblies are used to determine the thermal designof contacts and conductors, as well as the insulating material components of the current carrying parts. In addition, these tests are used to verify that the permitted temperature values are within the limits as required by national and international standards. In order to be able to analyze long-time temperature rise tests for the verification of suitability, I²PS GmbH's measuring system has been specifically expanded to make it possible to record, analyze, and document physical variables such as forces and voltage drops as well. Since temperature rise tests cannot be conducted with extra-low voltage for all test objects (e.g., frequency converters and soft starters), there is a wide variety of load circuits and motors available as loads for this purpose. Switchgear, distribution systems, components, terminals, etc. An arc fault is a short-circuit that can occur due to a fault between live parts with different potentials and/or between live parts and bodies and can be the type of a high-current arc discharge (ionized gas plasma with a temperature of approx. 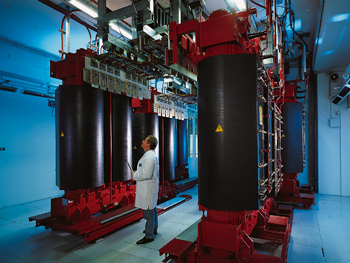 10,000 °C or higher – normally air). These tests are used to verify safety for operating personnel and the public. 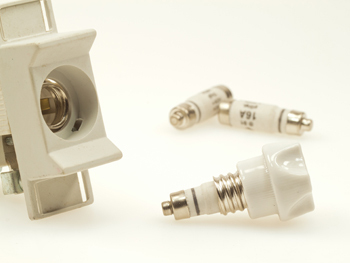 Devices such as electrical assemblies are protected from overcurrents by upstream protection devices. With our high-current test systems, we can determine trip values or potentially check if further to requirements from relevant product standards are being met. To determine the tripping current the test object is operated with its rated current. Then the current is increased until tripping occurs. Alternatively, the test object is loaded with a constant current, in which case the tripping characteristic is determined based on the time it takes for the device to trip. The purpose of conducting an impulse withstand current test on current-carrying equipment such as switchgear or power distribution systems is to determine the mechanical stability of this equipment when subjected to large dynamic electromagnetic forces caused by the high currents. Switchgear systems, distribution systems, busbar systems, etc. Short-time withstand current testing is used to verify that a switchgear device or a distribution system is able to carry a short-circuit current for a specific time without being damaged.